The first group of 6 Sukhoi Su-24 has been relocated from the Khmeymim base to Russia. The first six Sukhoi Su-24 bombers have already been relocated from the Khmeymim base in Syria to Russia and more aircraft will be back home soon, Russian Defense Ministry spokesman Igor Konashenkov told the media on Jan. 12. "The first group of six Sukhoi Su-24 has been relocated from the Khmeymim base to Russia. The withdrawal of other aircraft and also flight and technical personnel is due in the near future," he said. The four Sukhoi Su-25 aircrafts that were reported to have arrived at Khmeymim by the U.S. TV network FoxNews were dispatched there on the rotation principle, Konashenkov said. 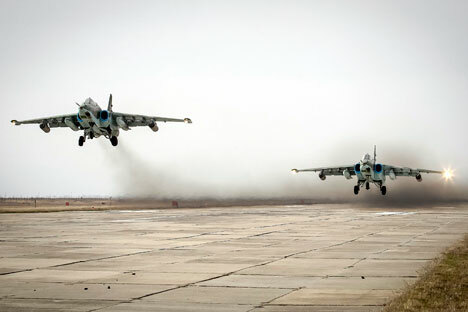 "In accordance with the schedule of routine rotation of aircraft four Sukhoi Su-25 attack bombers, equipped with advanced navigation and targeting systems, arrived in Syria several days ago," Konashenkov said. He also recalled that the Northern Fleet’s aircraft carrier-led task force has been on its way back to its Severomorsk base since Jan. 6. The Admiral Kuznetsov aircraft carrier has more than 40 aircraft on board. Russia started to reduce its military presence in Syria since a truce agreement took effect on Dec. 30. Moscow and Ankara pledged to act as its safeguards. The ceasefire agreement was concluded by the Syrian authorities and several armed opposition groups. It does not apply to the terrorist groups Islamic State and Jabhat Fateh al-Sham, formerly known as Jabhat al-Nusra. Both are outlawed in Russia.